In 2003, a mother-daughter team released a book with a stunningly reactionary thesis: Mothers' entry into the workforce was pushing middle-class families to the brink of bankruptcy, what they called the eponymous Two-Income Trap. 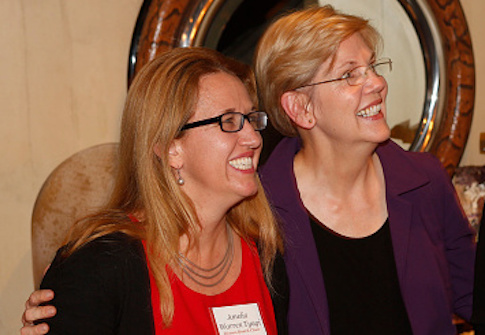 The authors were not arch-Republicans—they were now-Senator Elizabeth Warren and her daughter Amelia Warren Tyagi. With Warren's 2020 run, the book has attracted renewed attention, especially among conservative commentators who see in it a possible kindred spirit. That's not quite right. Warren and Warren Tyagi's diagnosis might be conservative, but their solutions are mainstream liberal. 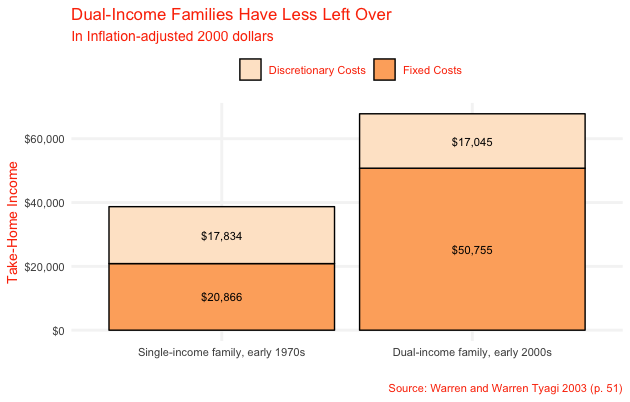 The Two-Income Trap tells us a lot about family economics but, just as important, it tells us a lot about how Warren's politics stop her from proposing real solutions to the problems she rightly identifies. The Two-Income Trap is, actually, a book about bankruptcy, an issue of which Warren has deep knowledge. In 1986, she wrote a thousand-page casebook on bankruptcy law; in 1995, she was appointed to advise the National Bankruptcy Review Commission; in 2001, she began working as a principal investigator on the National Consumer Bankruptcy Project, the data from which became the basis for much of the book. In analyzing these data, the authors identified an alarming trend. The people declaring bankruptcy were not poor or profligate. Rather, they had two qualities in common. One is kids: Warren and Warren Tyagi projected that one in seven families with children could be expected to declare bankruptcy by the end of the decade. The other was having two parents that work. "By the usual logic," they write, "sending a second parent into the workforce should make a family more financially secure, not less. But this reasoning ignores an important fact of two-income life. When mothers joined the workforce, the family gave up something of considerable (although unrecognized) economic value: an extra skilled and dedicated adult, available to pitch in to help save the family during times of emergency." This is the two-income trap: A second earner in middle-class households has, paradoxically, rendered them more financially unstable. This simple idea is easy enough to follow, but ominous in its implications. Is Warren arguing (as Tucker Carlson recently contended) that mothers going to work was a disaster for the country? The mass transition of mothers into the workforce is a relatively recent phenomenon. 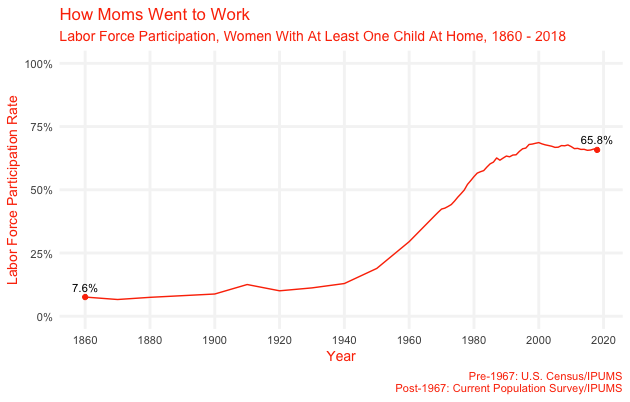 In 1860 just 7 percent of women with children at home were in the labor force. By 1940, 13 percent were, still just one in eight. But, after women went to work en masse during World War II, their labor force participation rate took off. By 1960 it was 30 percent. In 1978 it hit 50 percent. And in 2000 it peaked at 68 percent, before descending slightly to 65 percent today. This transition has had profound implications—including, as the authors argue, on the middle class's economic stability. Economists sometimes think about stay-at-home parents as a "complement"—someone able to manage the house and childrearing, so that the other spouse can dedicate his full time to breadwinning. Warren and Warren Tyagi add a wrinkle: The stay-at-home parent (traditionally mom) is a reserve source of labor. If dad loses his job, or gets sick, mom can go to work to help make up for lost income. In other words, stay-at-home moms are a kind of insurance, exchanging a second income today for its use in a disaster later. But that strategy leaves a lot of money on the table, and nothing obliges families to adhere to it. What if, instead, families used the labor power of women to their present benefit? The wave of working moms meant a mobilization of reserve labor, and in turn an explosion in two-parent-family buying power. Beginning with women's accrued savings after World War II, the two-earner model helped propel America’s middle class to unprecedented prosperity. Or so it seemed. As moms entered the workforce, their added purchasing power allowed families to bid up the price of goods on which they competed, like housing and access to good schools. This bidding war, in turn, drove up families’ fixed costs—meaning, as this book shows, that a two-earner family in the 2000s actually spent more of its take-home pay on things like the mortgage, child care, and health insurance than a one-earner family in 1970. This bidding war dovetails with the loss of stay-at-home mom insurance. Thus bankruptcy among the middle class: If dad loses his job, there is no reserve of labor to fall back on, and fixed costs are configured to expect two earners, making the loss of one all the more disastrous. We expect families to live more safely on two paychecks—in reality, they just fall much harder. The Two-Income Trap's conservative boosters see in this argument a sweeping denunciation of the effect that neoliberal market ideology has had on family life. But what is more telling about the book is that, having made the argument—an argument fundamentally about the economics of family structure—Warren proposes to solve it with a set of milquetoast mid-2000s liberal prescriptions. To be sure, Warren offers a variety. She wants to cut the cost of education with school vouchers and a tuition freeze, expand access to Social Security Disability Insurance, and reform federal bankruptcy and mortgage laws, among other ideas. These proposals have pros and cons. But they conspicuously fail to address the underlying dynamic that the book clearly articulates. Why won't the bidding war persist? How does cheaper school or bankruptcy reform fix the underlying reality of modern family political economy? When we think about it, though, it is obvious why Warren proposes all of these band-aids: Talking about family structure or saying there are negative effects to moms working is verboten among her far-left constituency. Explicitly pro-family policies would imply a normative goodness to family life when (today more so than ever) such normativity promotes paroxysms of rage on the left. Warren might retort that women going to work was a civil and moral victory, and she would be perfectly correct—by no means should we stop women who want to work from working. But what this two-income trap tells us—and what surveys show—is that for many middle-class moms, working is not what they want, but an imposition of economic reality on family life. Policy could both respect the choices of women and help fight the two-income trap by lowering the opportunity cost of staying home. Transfers to parents in the form of an expanded child tax credit and paid family leave would compensate stay-at-home moms for their otherwise unpaid labor. Regulatory reform could make part-time work, which the plurality of moms want, easier. A broader reprioritization of the breadwinner wage in political economy would help shore up families against the dangers of two-income bankruptcy. The goal of such a policy is not to stop mothers who want to work from doing so, but to give society’s support to mothers who believe their families are better served by them not working. For 2020, Warren has offered her own family policy, universal child care. Studies show similar policies in other countries drive up women’s labor force participation—and so may exacerbate the two-income trap—at the cost of worse outcomes for kids. Would Warren the author counsel Warren the candidate to take this path? Perhaps Warren does not understand the implications of her own work, or does not think substantive pro-family policy is possible. But she's almost certainly too smart for that. Instead, The Two-Income Trap in turn reveals the trap that the left has set for Warren. She knows what the problems are—but she will never win a Democratic primary by saying so. This entry was posted in Culture and tagged Book reviews, Elizabeth Warren. Bookmark the permalink.